Dimensions (W x H x D):4.25 x 4.25 x 1.38 in. Just install them they look good!!! This is a great product at a great value. The product is fine and your price is less than half of that of others. 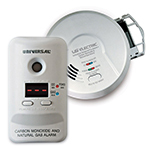 I needed to replace the smoke in my RV and this the type of detector that was in it. At the time I was looking for detectors I found you had this 6 pack and I thought I should replace the detectors in my home. They are working great and easy to install. 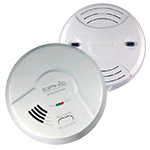 I am very pleased with the efficiency and ease with the handling of my return of the smoke detectors. I was able to order the correct ones with one phone call. I discovered a smoke detector that was too old. Lots of my other ones were also. Even though they still tested good, they may not have worked in a fire situation. 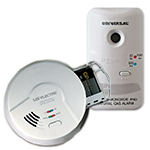 The test buttons only test the alarm, not the sensor. So I ordered this 6-pack and I am now secure and safe again. A wonderful product!! And since most permit inspections require one in each bedroom, this is a fantastic way to satisfy that requirement.